This museum has been opened for the occasion of LD4all's 14th anniversary. You may have read the History of LD4all already. Now, I present to you: the Museum of Lost memories. Background story on the Museum Of Lost Memories: It came from a very vivid lucid dream. I have excavated a few LD4all treasures, some of them never been seen online before. Enjoy! 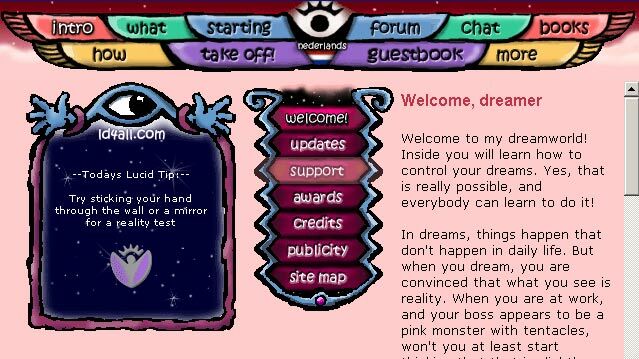 The prehistoric era, when the website currently known as LD4all was being designed and built. Although it was online at the time, it wasn't officially announced yet. 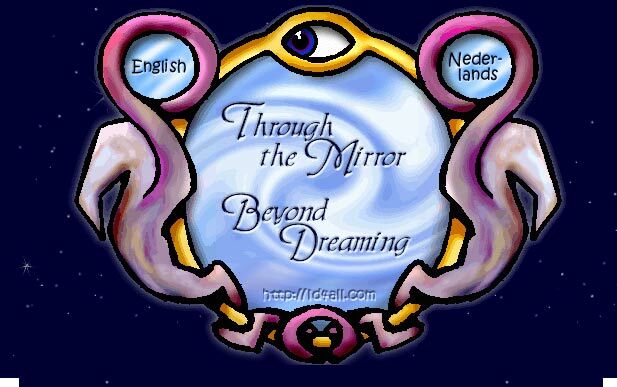 first era: "Through the Mirror, Beyond Dreaming"
This first era,is the officially launched website. The design was inspired by a lucid dream. It didn't have a lot of text, but many, many animations and images. The aim was to bring in a dreamlike feeling where the visitor could wander around. The Era We Had The Wings. You will see why when you go to this room. Transition Era: From Through the Mirror to LD4all. The Transition Era. The domain LD4all.com is now registered, but the site design still is "Through the Mirror" style. Some new elements pop up though. The LD4all era. A completely new design, with a new logo. The evolution of mirrors throughout the ages. I mean, come on. It was called Through the Mirror. Links to treasures excavated by members and holding fond memories. 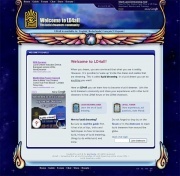 The prehistoric era, when the website currently known as LD4all was being designed and built. Although it was online at the time, it hadn't been officially announced and I doubt anyone managed to find it in those days. The design was inspired by a lucid dream. It didn't have a lot of text, but many, many animations and images. The aim was to bring in a dreamlike feeling where the visitor could wander around. We see already the wings and eye theme taking shape here. (1) A navigation image that didn't make it to the final version and (2) the navigation image that did make it. A book that didn't end up in the reality check section, and an alarm clock that did. This is one of my favorite animations I made for the site. This guy was the link to the flying course. My lovely assistants, demonstrating the two most popular flying techniques. *random fact* All animations were made on my amiga 3000 with Dpaint IV. The Era We Had The Wings. Why is it called "The Era We Had The Wings", you wonder? Every section a different colorscheme. Websafe colors, all the thing in those days. The Transition Era. The domain LD4all.com is now registered, but the site design still is "Through the Mirror" style. Some new elements pop up though. 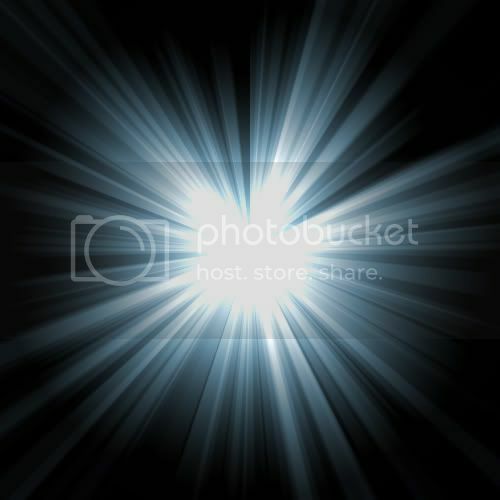 If you click the above image you will see the url ld4all.com written below the "Through the Mirror" title. (click to enlarge) Do you notice the "LD4all.com" right below the eye of the mirror? 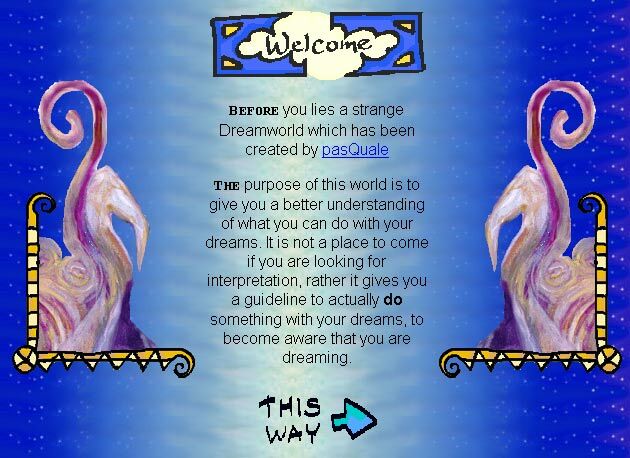 An extremely rare commemorative plaque, made by the legendary DreamAddict, to commemorate the fact that we had left the old Network54 forum and moved to our own new forum. You may have noticed a striking difference with the previous designs: No more wings... instead this colored menubar with an attempt to make it a bit winglike. 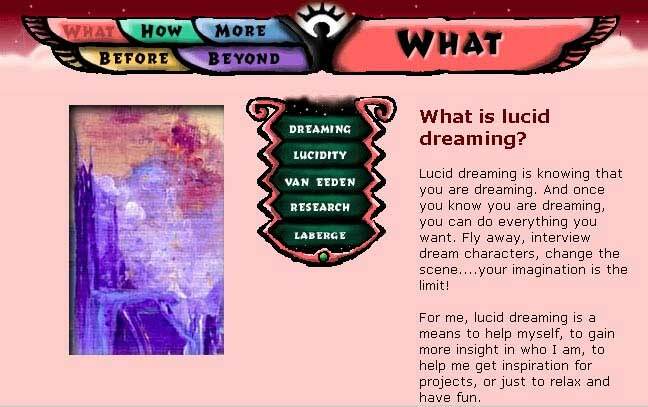 The LD4all logo, as well as the inspiration for the layout came from a lucid dream. The first Quick sketch of the logo, just after waking up from the lucid dream it was shown, a sketch later that day, with dream image still fresh in mind and lastly the final logo. 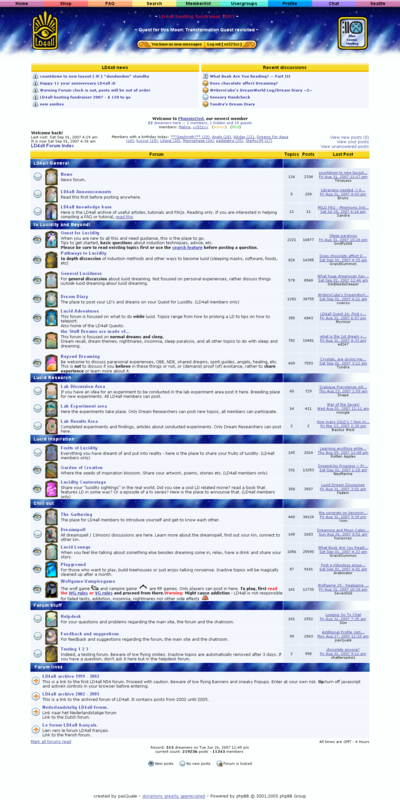 The forum used the same eye icons as the previous forum, but it also had mirror images added for each subforum. New ranks, rainbow stars for the mods and admin. And eventually a bit more smooth. And the logo got a slight overhaul. Because it was called "Through the Mirror"
Mirrors have always featured in some way or another. The mirrors really took of halfway the second Era, when I added decorative borders around the paintings. Before that they were just images. 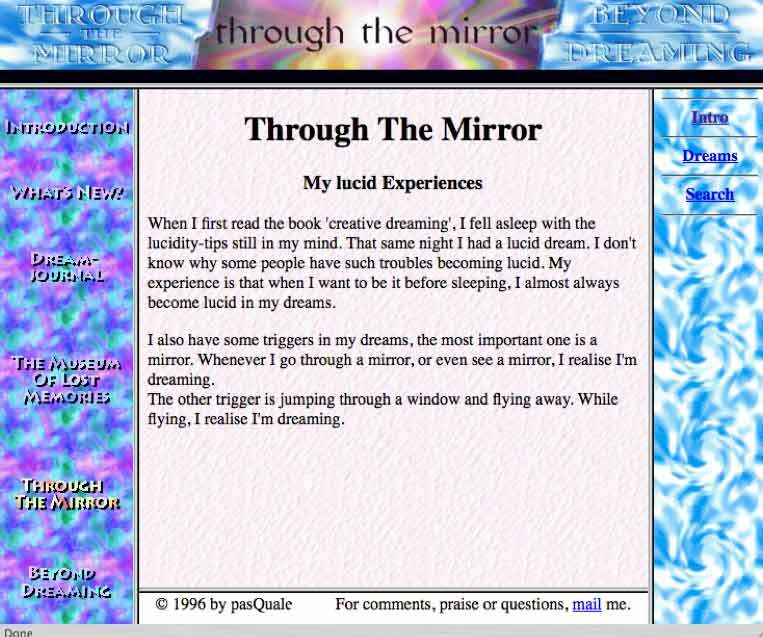 I made it a mirror theme, and every section of the site had their own mirror, with different images for each subsection and bonus images when clicking certain links in the text. In the transition stage to LD4all I made a huge mirror splash screen. In the LD4all era, I wanted a mirror to remember the "Through the Mirror" time. I chose one mirror design. The function remained the same: different paintings in the mirror for each section, and also changing images when clicking on certain links. Smaller versions of these are used in the forum. So if you ever wondered what those were, now you know. Artifacts somehow having to do with LD4all. This flag was made by James, (AKA One Armed Scissor) apparently a big fan of Bruno. This flag is known to be waved by other people as well. It even was part of signatures. Post your fondest LD4all memories, be it from far in the past or be it from recent times. It would be cool if you can accompany your tale by a screenshot. You can also post LD4all artifacts you have excavated yourself - these may range from smilies never seen on the forum, to forum icons of now lost forums (or maybe never used? 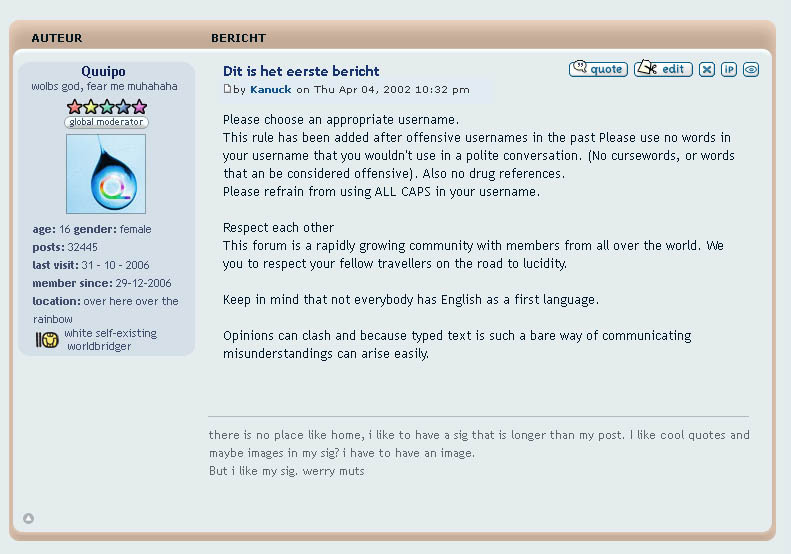 ), to the most precious artifacts you just have saved for posterity. Treasures that belong in a specific era may also be put on display there (meaning: I'll add those to that page ). I'm looking forward to see your treasures! I've got no screenies so maybe someone can help me with that- but thanks to Bruno i remembered the best topic ever: Testeiez. I'm pretty sure we broke 100 pages with that one, am i wrong? 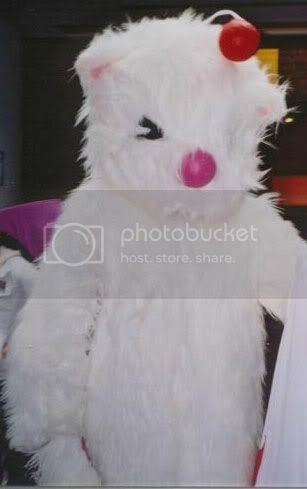 And then there's that picture. 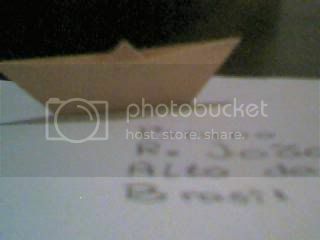 And that thing in my drawer, next to the little orange boat thing. And the lost memories. Hmm... I don't have much. Though I do have a key to a building known as the second addict hotel. Such as the Apenheul meeting with the Dutch LD4all forum, or meeting Q&A for the first time, giving Bruno a real hug and having a beer with him, aQua/Water and Q&A.